I know self-reflection is difficult. Remember that this is all in service of improving your safety management systems process scope and scale to work in better concert alongside your construction business operations. Ask these questions over and over to become comfortable with them so if you are faced with a situation where you perhaps need to ask them of your stakeholders, it won't come off rehearsed. I guess what I'm saying is, operations need to get comfortable addressing the elephant in the room. Let's review 10 questions that can help you determine whether it's time to evaluate an SMS for your construction business. 1. Do you have a visible organisation-wide location for storing and accessing construction safety procedures and instructions? This is bog-standard. Answering it is the first step toward recovery. Do you have any central construction safety procedures to speak of? Maybe a 4 ring binder? A battered manilla folder? Do you hate your current solution when you speak it out-loud? 2. Do you have disparate systems to manage the SWMS and risk assessment process, including different systems used by different groups? Recall the point in the introduction about creating a construction business that prevents known risks impacting on its objectives. Consistency in your SWMS and risk processes facilitates more predictable outcomes for all activities as the need demands. So, maybe you need a standardised risk assessment process to get all workers, young and old, on the same platform? 3. Do you use spread sheets or other manual paper systems to store and track worker and contractor records? If the current system is manual, visualise a world where it isn’t. Worker (Contractor) tracking is automated. Outreach is automated. Internal and external reminders are automated. How much time does that save you? How much time does it save you when multiplied across a team of 5, 10, 30, 80 or 800 people? 4. Have you tried getting your team to adopt a unified system to manage workers and contractors, but ran into difficulty? The first divergent question. Play close attention: have you tried to implement technology like this in the past? Did it fail? Why? Figure out why. It may be because the system was weighty and too complex for your needs. Or it might be because supervisor Brian hates how much Minecraft his daughter plays, so he distrusts computers, and never logged anything into your Excel spread sheet. It's important to understand the landscape and recognise challenges associated with Construction Safety Software solutions, as they vary from one system to another. Don’t be scared off by them, but give them their credit as a potential difficulty. 5. Do you have a way to escalate incidents and corrective actions besides email or hard-copy? Some describe Construction Safety Software as the great hinge that all shared occupational health and safety efforts swing upon. It swings one way, senior management stocks it with processes and instructions. It swings back the other way, supervisor plucks the ripe processes and returns helpful info back to management, based upon their findings. Even better, an Construction Safety Software application isn’t some swinging pendulum. It’s a basket in the middle of the room. Everyone can contribute to it. It sits still. Access is immediate. No real passing takes place. Would you say your current workplace health and safety system does that? 6. Is there cross team visibility into information for each incident or audit report including notes, telephone calls, and scheduled tasks? Can everyone on your team access all each other’s notes and actions in your current system? This isn’t just about sharing data. It’s about making sure you know that an issue has received a follow-up, who completed the task, and how. 7. If one of your managers or supervisors left tomorrow, would you be able to easily access the actions, inspections, investigations, and process history they were working on? Continuity and scalability’s importance must be reiterated. A construction manager/supervisor with their own filing system could leave and log out of Evernote on their work computer. They walk out. All their work goes with them. A Construction Safety Software application could solve all this and help you avoid unforced losses. 8. How do you confirm audits and corrective actions are receiving timely follow-ups? For the construction managers in the audience: can you be sure your crafted safety management processes are being followed and your hires are executing to their given responsibilities? An construction safety application with a view-creation feature, sorted by role, and most touch, could tell you with only a few clicks. 9. How do your team receive reminders to follow up with investigations? Also, rather than getting up from your desk or bugging your team members about something that innocently slipped their mind for a moment, just ping them via the SMS’s system? Man, you could probably do a lot with one of those. 10. 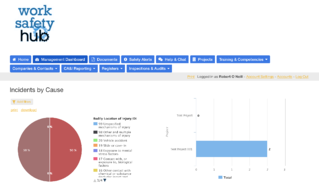 Is it easy for managers and supervisors to view prioritised incidents and actions based on criteria, or to quickly see a view of dashboard status? Taking the previous point one step further, it’s important to have a prioritisation system for following up, giving the more significant issues their due attention. How long does it take to make that distinction? Make no mistake, an Construction Safety Software application is an investment—one of time, if not of money. Managers, Supervisors, Workers and Contractors need to adapt to it. A manager may need to train them on its functionality. Established, proven processes may need to be recreated in the new system. An Construction Safety Software application is a fix for several challenges. It is a bridge between your workers to your management level, to your contractors, to your executive, to your current customers, and back again. If unifying those business pillars is a goal, it is in your best interest to review these questions, and find the solution that fits best. We have been researching, implementing and customising both simple and sophisticated safety management systems software for years. Check out the Work Safety Hub Construction App!